The health benefits of olive oil make it an extremely attractive ingredient to use for cooking. Packed with polyphenols, amino acids and healthy, monounsaturated fats, olive oil can be a key factor to not only establishing a balanced diet, but to add depth and flavor to food. Most importantly, the main difference between using olive oil as opposed to refined vegetable oils is its aroma and taste. Olive oil is not just a cooking oil; it is an ingredient that can add depth and flavor and enhance the more traditional tastes of the dishes you love. No other oil can match the organoleptic complexity of olive oil and the thousands of varieties that carry their own unique flavor characteristics. Whenever we refer to olive oil, we always mean extra virgin. Every producer we carry has worked for years - many for decades - to micromanage their crop and produce the highest quality olive oils on the planet. To them and us, it’s not worth it if it’s not extra virgin. Since heat is such an integral part of cooking, yet is also one of the factors that can lower the quality of an olive oil, many people assume that applying heat to olive oil in cooking applications such as shallow and deep frying, stir-frying or sauteing, is a combination that should be avoided. Heating an extra virgin olive oil to frying temperature does not hurt or substantially alter the chemical composition of the oil if kept below the smoke point, and is still very good for you due to their polyphenol content and high levels of oleic acid which is very stable and does not easily oxidize. The alternatives - i.e. canola, soybean and corn oils - are significantly less stable, contain little to zero polyphenols and can break down into dangerous, toxic byproducts at high temperatures due to accelerated oxidation. Olive oil, coconut oil and palm oil are the most stable of all fats when heated. The smoke point of a true extra virgin olive oil is 410°F, well above the 350-375°F that is required for most frying. If the olive oil is higher in acidity and/or contains impurities (often representative of lower grade, mass produced oils), the smoke point can lower some 50°F. That said, you should always fry foods with a high-quality olive oil and should avoid mixing it with other types of oils. To properly fry with extra virgin olive oil without destabilization, first heat the oil in a heavy pot or pan to the suggested temperature by using an oil thermometer (sometimes called deep fry thermometer). Starting at the burner’s medium setting will allow you to raise it little-by-little until you achieve the right temperature. Adding the food to the pot or pan after the oil is fully heated will prevent the food from absorbing too much oil and becoming soggy. Deep Frying tip: Though the added flavor will be best when frying the first time, reusing a large pot of olive oil 4-5 times is still safe and flavorful (and not to mention cost-effective) if doing so within a short timeframe and if properly strained after each use. Frying with olive oil has been a standard practice in the Mediterranean diet for centuries. Try shallow frying eggs, sliced potatoes or fish in extra virgin olive oil and you will be amazed by the results. When a recipe calls for butter or margarine for frying or sauteing, olive oil is an oft-practiced substitute and is widely recognized as a much healthier alternative. All extra virgin olive oils range in strengths of intensity and pungency, so while some varieties work wonderfully with almost anything, others may prove too overpowering. For cakes, cookies and other baked desserts, sweeter, more mild olive oil varieties - such as Arbequina, Peranzana, Mission, Nocellara and the fruity Koroneiki - are less likely to overpower the flavors of a dessert when compared with more bitter, pungent varieties like Picual, Coratina and Moraiolo. When summer hits and the grills come out, so do all the wonderful marinades and sauces that make grilled foods so exceptional. Extra virgin olive oil has endless potential to boost the flavor of grilled foods and can neutralize harmful carcinogenic substances thanks to its high antioxidant levels. Robust oils, such as those produced in Tuscany, Lazio and Trentino Alto-Adige, pair wonderfully with grilled meats, while the milder olive oils from Greece and Southern Italy are ideal for lighter grilled foods like fish. A flavorful EVOO can also replace butter for grilled favorites like corn on the cob, portabella mushrooms, potatoes, onions and shrimp. As previously noted, Peranzana and Arbequina are the most similar olive oil varieties to butter with their sweeter, more delicate flavor profiles. Extra virgin olive oil is a perfect companion for meats given its peppery qualities. Whether sautéing chicken or dressing a steak, olive oil will bolster the rich, mesquite flavors we know and love. Finishing red meats with a robust olive oil can make a world of difference for a food that is already so rich in flavor. Try drizzling a Moraiolo or Picual variety olive oil on steak, lamb and pork for a flavor explosion. For poultry, sauteing chicken or duck in olive oil can crisp the edges and lock in flavor. For lighter meats, try using the Mission variety from California or a rosemary-infused olive oil. Extra virgin olive oil and fish are staples of the Mediterranean diet. Many varieties of extra virgin olive oil work well with fish, but the more delicate the better. We recommend Koroneiki from Greece, Arbequina from Spain, or Nocellara and Itrana from Italy. Nothing complements a delicious bowl of pasta more than a flavorful extra virgin olive oil - a concept as old as Italian cuisine itself - and a premium Italian extra virgin olive oil will do just the trick. An obvious choice for pesto, another excellent way to use extra virgin olive oil with pasta is as a finishing oil, lightly drizzled over the final dish just before serving, to experience a gourmet restaurant taste right at home in your own kitchen. In fact, an oil packed with fruitiness and pungency provides enough flavor for simply dressing freshly cooked pasta noodles with nothing more than parmesan cheese and freshly cracked pepper. Delizioso! Countless soups - including chowders, bisques and stews - are perfect for garnishing with olive oil. Not only does it intensify the flavors but it also adds a little pizzazz since the oil usually floats in mini green puddles on the top of the broth. A section about olive oils and vegetables is a bit silly given it’s the oldest combination in the book. The most common use for olive oil is to drizzle it on salads. Sounds easy enough, but it’s worth mentioning that specific varieties work differently with different types of salads. 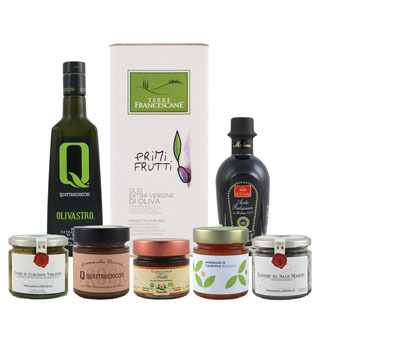 Greek olive oil works well on Greek salads of tomato, cucumber and feta cheese, while robust Italian oils work well on bitter greens such as arugula, endive or broccoli rabe. If grilling, lightly coat the vegetables before grilling to prevent sticking and then drizzle with your favorite oil once ready to eat. Olive oils are rarely touted for their strengths with fruits (minus the “fruit or vegetable” argument for tomatoes and cucumbers), but there is one tried and true strength. Fruit salad, when dressed in Koroneiki or the more obvious orange-infused olive oil, works quite well and enhances and harmonizes the sweetness of the dish. An excellent flavor combination common in the Mediterranean diet is that of extra virgin olive oil and protein-rich pulses, also known as legumes. Common pulses such as black eyed peas, chickpeas, lentils and broad beans can be significantly elevated in flavor by simply dressing the cooked legume of choice with a fruity extra virgin olive oil and light balsamic. The most common olive oil snack is simple: bread and EVOO. Many people learn the flavor complexities of olive oil through dipping, and it sure makes for an easy appetizer for any gathering. However, there are other less common ways to snack with olive oil that are worth exploring. Drizzling olive oil on popcorn, for instance, is an undervalued delicacy. The peppery qualities of olive oil do wonders for plain, white popcorn, especially for snackers who prefer to stay away from butter. Peranzana and Arbequina variety olive oils are perfect for those searching for a flavor enhancer or butter replacement, while the Picual variety serves well to sophisticated palates unafraid of bitter qualities. Also intriguing and gaining in popularity is drizzling olive oil on ice cream. Yes… ICE CREAM. Try the Taggiasca or Picholine varieties over your next bowl of vanilla frozen yogurt, ice cream or sorbet. “Olive oil and alcohol? Are you crazy? !” is the average shock response we get to the idea of combining the two. Mixologists around the country have included olive oil in special martinis and Bloody Marys, and some have even created completely new concoctions.